The note featuring a celebrated oil worker was the star of a Stack's Bowers sale in Hong Kong. 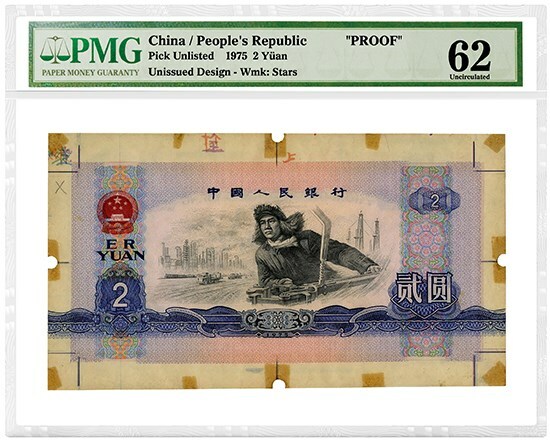 A stunning China 1975 2 Yuan Proof that was certified by Paper Money Guaranty® (PMG®) was the star of a Stack's Bowers paper money auction held March 25 in Hong Kong. Graded PMG 62 Uncirculated, the note was the top lot in the auction, realizing $240,000 (USD), far above its pre-auction estimate of $75,000 to $100,000. "We are very pleased with the result of this note in our auction," said Aris Maragoudakis, director of World Currency Auctions at Stack's Bowers Auctions. "This is an excellent example of the strength of PMG certification." In fact, nine of the top 10 prices realized in the auction were for lots certified by PMG, a leading paper money certification service. 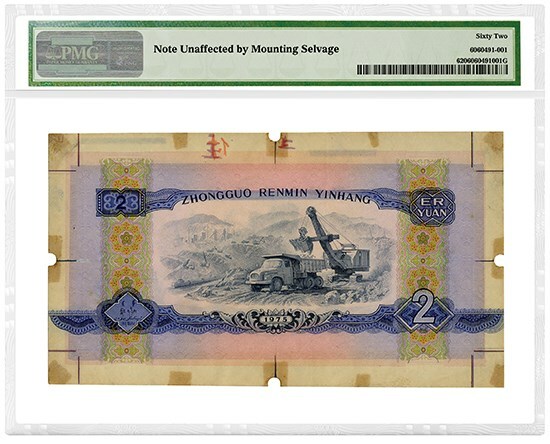 Founded in 2005, PMG has graded nearly 4 million banknotes from around the world, about half of them from China. "PMG is honored that collectors and dealers continue to look to us to certify the greatest paper money rarities," said Steven R. Eichenbaum, CEO of PMG. "Bidders feel greater confidence because notes in PMG holders are backed by the PMG Guarantee of authenticity and grade." Lot 50163: China 1951 5,000 Yuan, graded PMG 20 Very Fine. Realized $51,600. Lot 50456: Straits Settlements 1901 100 Dollars, graded PMG 25 Very Fine. Realized: $40,800.